Blue Sky approaches to drug development opens the door to breakthrough therapies. Smart Pharmaceutical Consulting, West Chester PA 19380. Technology is an enabler for partnerships and collaborations and it’s this that provides the foundation that is the driving force for therapeutic innovation. lack of standardization due to not being accustomed to standard practices. As a result, these linkages between academia and industry, although they have been in existence for decades, in many cases have been patchy for the reasons highlighted above. More often than not these more “traditional” collaborations have resulted from situations that have their origins in an early stage drug candidate discovery, or where a new class of molecules has been reported on in the scientific literature. From there the conventional pathway has frequently been to in-license the work and develop things in-house in the corporate company’s R&D Institute, with the key academic experts being retained as expert consultants and perhaps doing additional work to identify other opportunities. Although this type of mechanism is still in effect, during the last 10-15 years there has been a shift into a macro network collaborative mechanism involving teams of experts, in a global network, to help to maximize the probability of success. During this evolution of academia and industry’s cooperation, these groups have learned that the advantages far out way the risks. Technology is the basis for bringing the groups together to discuss strategies and to share data that will frequently build new platforms, which in turn help everyone understand and define the objectives. This framework allows for the learning systems module approach. Streamlining of front-end processes (which means time and money savings). Frequently the model can follow a pattern that is to have a candidate such as a protein (your favorite protein), identified by industry and then this is handed over to an academic center or team of experts over several academic centers to do investigational work. Its often in key academic centers where the key medical experts work. They have decades of experience and frequently hundreds of peer-reviewed scientific papers in key periodicals. These individuals have their own networks of collaborators borne out of common interests and scientific respect, so there is a natural working density, something industry with its huge financial resources will not match internally from its own resources.
. A similarity might be like an NFL team trying to buy up all the best talent. Not even the most successful team franchise has enough money to do that. With these networks in-place and with the financial backing that the industry brings, the potential for synergy and improvement in the development cycle is very significant. The academic centers are looking for direct funds and support to win prestigious government grants/contracts such as those from NIH here in the USA for example. This might include a license fee coupled to some legacy royalty payments. The company is looking for a product with patent protection and opportunities for follow-on products. In realizing this type of structure, frequently the program can flow as follows, although each situation can have a variable component based upon the people, institution, company, and product involved. The protein /candidate of interest is identified by the company /industry as a potential therapeutic candidate. This is handed over to the academic team together with financial support for them to research and look for potential medical applications. Support from government grants, from NIH and other sources, is made available and this cements the academic and industry union, ensuring a commitment to produce a mutually relevant outcome. The project is developed using the collaborative network to a point where a serious candidate application becomes a reality/possibility. As this occurs, industry assumes the responsibility for the costly clinical trials and trial management until the candidate either fails or makes it a viable therapy. In the case of success situations, the licenses are worked out and the full regulatory and manufacturing machinery, are moved into high gear to register to make and commercialize the new opportunity. So, in drawing attention to this mechanism let us review the success of this academy/industry experience by examining a few case studies. Psoriasis; which represents a more mature product line. Since we are hosting this convention in Philadelphia. let’s begin with CAR-T which is a first of a kind therapy that represents the success of the University of Pennsylvania and its various collaborators. CAR-T Chimeric Antigen Receptor cells are promising treatments for hematologic and solid malignancies. CAR-T cells are considered as such because they recognize and eliminate cells expressing specific protein antigens. Europe providing the next significant concentration, followed by China. Figure 6 demonstrates the international nature of the of experts working on CAR-T and the relative concentration distributions. Nigel Slide 7: Carl June affiliations. In all Carl June has received 81 grant payments with > $10MM received from the National Cancer Institute and >$30MM from the National Institute of Allergy and Infections. Nigel Slide 9: CAR-T Carl June NIH Grants Awarded. As one can see from Figure 10, the trend is to be included in the expert’s pool of collaborators so as not to be “outside” as break throughs in technology occur. Nigel Slide 10: Payments from Industry to Carl June. Lastly, looking at the clinical trials emanating from all this collaborative work, we see the following upturn in clinical trial activity which is suggestive of the closeness of the academe/industry relationship. This is illustrated in Figure 11. Such a situation is frequently the indicator that licensed products may be near as new therapeutic treatments. Nigel Slide 11: Clinical trials for CAR-T development programs. This is an acronym which stands for: Clustered Regularly Interspaced Palindromic Repeats, is potentially a powerful platform technology that could yield treatments for a wide variety of therapeutic categories. CRISPR is a unique family of DNA sequences in bacteria that can be used to boost the immune system. It has been adapted from the natural defense mechanisms of bacteria to foil viruses. The protein Cas9 is the protein of interest and its enzymatic action enables the editing of parts of the genome by removing, adding or altering sections of the DNA sequence. The Cas9 acts as molecular scissors that cut strand s of DNA at a specific location in the genome. Next, a piece of RNA called guide RNA (gRNA), that’s been pre-designed and located on a longer RNA scaffold binds to DNA via the scaffold and the predesigned sequence “guides” Cas9 to the correct part of the genome to perform the splice. This guide RNA is designed to find and bind to a specific sequence in the DNA. Since the base sequences are complementary, this means that the correct binding will occur rather than at a random place in the genome. When this occurs, the Cas9 follows the guide RNA to that same point in the DNA sequence and makes a cut across both strands of the DNA. At this point, the cell recognizes the DNA is damaged and tries to repair the damage. Now as this occurs there’s the option to artificially use this repair machinery to introduce changes to genes in the genome that could be beneficial therapeutically. By studying this action and its outcomes drug companies and academic centers can learn about new chemical entities /structures that might produce effective therapeutics. So how does this collaboration differ from the CAR-T example? It’s a much larger situation because it is not targeted at one single therapeutic area but instead is a technology platform that can reach any disease category. As a result, this is a very powerful generator of therapeutic candidates and gives a very futuristic approach to how medicines could be designed. This then is the key and with over 8,000 experts in CRISPR in the US alone, the field is “hot” with activity because of the possibilities seem limitless. Figure 13 illustrates the locations of the 8,000 experts linked in the US, in particular, there is a high concentration of activity in the North East and in California. If we look at the clinical trial activity, we see there was only one trial in 2015 but now in 2018 there are 5, so that’s a very significant increase in trend. Also, if we review the areas of investigation we see a variety of cancer areas being targeted. This is illustrated in Figure 14. As a key indicator of the academic /industry activity we see some very substantial NIH grant payments, increasing exponentially through 2017 with more expected in 2018; targeted at cancer, diabetes, allergy, infectious disease etc. This is illustrated in Figure 15. From the US experts in CRISPR, we can again demonstrate the degree of collaborative activity by looking at the network of Michael Miller at Merck Research Laboratories. Michael has targeted collaborations with a variety of academic centers and depending upon the recipient of grant these network collaborators may be active or inactive for various periods and we see that on the network chart here. This is illustrated in Figure 16. The Final example, which highlights the success of this network model for academic /industry development activity, is a study in psoriasis as an established disease to leverage funding opportunities. If we look at the relative distribution of diseases severity, we notice that approximately 2/3 of the population is relatively mild and only 8% falls into a sever category. This is illustrated in the pie chart in Figure 19. Looking at the experts in the file we can identify 60 top active experts in Psoriasis. This is illustrated in Slide 19. Since 2000 the number of publications on psoriasis has quadrupled to over 2000/year. This is illustrated in Figure 21. For the purpose of this analysis, we’ve chosen Mark Lebwohl whose an academician at Mount Sinai hospital in New York. Mark has 425 peer-reviewed publications and has been involved in 15 clinical trials. In terms of clinical trials, we see over 800 clinical trials have been performed for psoriasis and this has increased progressively since 2005. This is illustrated in Figure 21. Looking now at the payments to Mark Lebwohl, in support of his collaborative research, he’s received $920,000 from grants and approximately $1.2MM from industry sources as illustrated in Figure 22. Again, this demonstrates how both sources of funds are being used collaboratively to generate a mutually positive outcome. In terms of a more granular breakdown of these industry payments, we see Eli Lilly, Novartis and Janssen have been the most significant financial contributors to this work. This both demonstrates the real fostering of scientific collaboration between academia and industry and sharply addresses the realization that although companies may be in competition with each other, mechanisms can be established and structured which will allow them to conduct work side by side without interference. 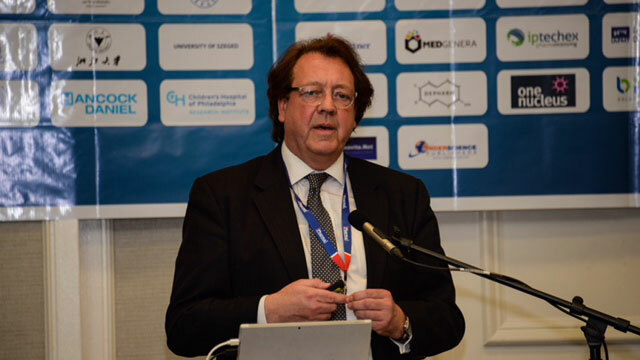 In conclusion then, given the cost and complexity of therapeutic discovery and development today, and in order to deliver high-quality medicines to the global community within a reasonable timeframe, the future must be through these macro network relationships if it is to deliver its scientific commitment to society. By way of acknowledgments, I’d like to thank Karen Helm of Monocl for help in the preparation of this manuscript and to her company Monocl for access to their databases for various pieces of relevant information. Nigel Slide 24: Acknowledgement to Karen Helm and Monocl.